Direct-vent Heritage Stoves come standard with American Hearth’s Slope Glaze Burner system, which adds an extra inch of ember bed. Topped off with the hand-painted ceramic fiver log set and glowing embers, the effect is stunningly realistic and guaranteed to keep you and your guest mesmerized for hours. The Millivolt system lights a standing pilot with a push button piezo ignitor. Once the standing pilot is lit, the MV system operates with an on/off switch or optional remote control system. 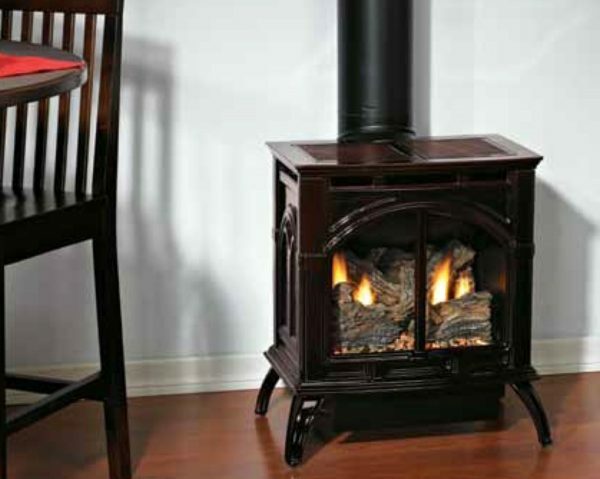 The standing pilot allows your Heritage stove to provide heat during power outages. All Heritage Cast Iron Stoves ship assembled in one carton, for easier set-up. You can place your Heritage Stove directly on carpet or tile.